Track: The Melancholy of a 35-Year-Old | Game: Ripened Tingle's Balloon Trip of Love | Composers: Masanori Adachi, Tomoko Sano, Kiyoshi Hazemoto. 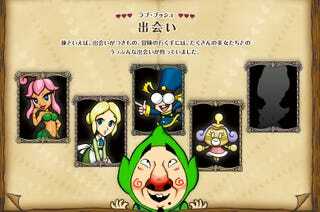 Unlike Luigi, Tingle didn't have to beg for a video game of his own, as a matter of fact, Tingle got three games in the span of three years. Poor Luigi... It all feels like this was an impractical joke by Nintendo, and worst part of it all... these games were never released in the Americas (count us lucky, or maybe unlucky).